In recent years, Disney has been toying around with their “Princess” brand, making their popular films and characters even more marketable to children–namely, to young girls. This isn’t really new: Disney has changed the designs of their princesses to fit with market trends numerous times since the first princess, Snow White, debuted in 1937. Controversy arose, however, when Disney began retooling their princess brand for new products last summer, tweaking their make-up and outfits, and changing other, more integral aspects of their characters. The redesigns are noticeably more glamorous and more bedazzled. Princess Aurora (from Sleeping Beauty, 1959) and Belle (Beauty and the Beast, 1991) no longer have the visually-flat hair of their movie counterparts, and are instead featured with the shimmering, flowing locks frequently seen in magazine ads. Each princess is now donning enough jewelry to keep a reporter on the red carpet busy for a good while. The added make-up and glitz being marketed to young girls is problematic. These images aren’t “just” cartoons, they’re prominent and effective marketing products (so prominent, in fact, that on the day this post is published, Toys R Us lists 987 different Princess products). Disney is the largest media conglomerate in the world, and the Princess brand is one of its most successful marketing tools. It’s impossible to ignore the significance that these characters have with children, and how Disney uses this influence to make money. But inspiring young children to be conscious of make-up and beauty isn’t Disney’s biggest crime this time around. What’s most troubling about this redesign is how it deals with race. Of the canon ten Disney Princesses in the brand, six are white. This summer, Merida from Brave is slated to become the next Disney Princess. In 2014, Anna, the protagonist of Disney’s next animated film, Frozen, will become the twelfth Disney Princess. Both Merida and Anna are white. This is why these redesigns are so troubling: Pocahontas and Mulan became whiter. 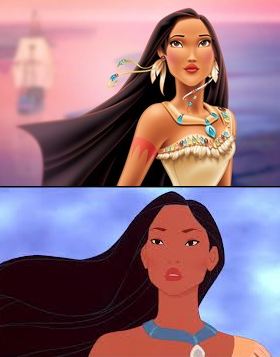 Pocahontas’s skin was lightened, her face has become more narrow, her nose has also been dramatically narrowed, and her eyes have become larger. Mulan’s skin changed from the darker tone she was in her film to straight out white; her eyes were given prominent blue undertones; her lips were made thicker. Her dramatic make-up and new, glamorous, dress seem to be directly counter to her personality and character in her film. Jasmine, the first non-white Disney princess, is white washed, too. In fact, save for Tiana, all of princesses of color have been whitewashed. To add on to all of this, in new merchandise, these princesses have been noticeably pushed to the back or left out completely. Even with this change, Disney and their characters and princesses are still overwhelmingly white, and that doesn’t look like it will change in the near future. This Could’ve Been Frozen, a blog that started up in December, showcases fan art for Frozen featuring indigenous peoples instead of the light-skinned, blue-eyed cast, pointing out to fans–and to the company–that Disney could have diversified their princess line-up. So many people are fans of Disney. Not just little girls, but people of all genders, all sizes, all orientations, all abilities, and all ethnicities. For their popular princess line, Disney prefers to portray one demographic of princess, simultaneously alienating so much of their fanbase. I also think it’s interesting that, in all their “attempts” to diversify their line of princesses, such as the recent addition of Tiana, the first black princess, they still haven’t had a Hispanic princess or story. (Sofia the First, by the way, who was originally announced as Latina, was later proclaimed to not be of any particular heritage) Spanish is one of the six official languages of the United Nations, yet there has been no effort to include a Hispanic princess. Considering there is an entire continent made up of nations, most of whom declare Spanish as their official language, this is quite surprising and disappointing. Personally, I grew up watching (what I consider) the more independent princesses, like Pocahontas, Belle, Mulan, and Megara from Hercules. While they were independent, though, I still liked the idea that they could stand up for what’s right and still fall in love. I think that’s an idea some people forget or dislike – they think the princesses only fall in love and can’t do anything for themselves. It’s okay to fall in love, but it’s okay to be independent, too. I think finding the balance is important. Also, while we’re on the subject of diversity, I think it would be really cool to see a princess with some sort of disability, either physical, developmental, mental, anything would be nice. Perhaps someone with autism or ADHD, since more young kids are being diagnosed nowadays with those disorders. Wow, that was long, sorry about that. I have lots of opinions (positive and negative) about Disney, I can’t help it! Rachel, your comment was excellent! As an older (60+), overweight woman of Hispanic ethnicity,I applaud you for recognizing the need for diversity among princesses, as among other characters. We are not all young, white, thin or even *whole. * Neither are we to be dismissed! Rachel, your points are absolutely true and I agree with you completely. I couldn’t have said them better myself. There IS a balance; people seem to think princesses aren’t able to do anything for themselves, but that’s not true-Merida isn’t the only one who’s strong, brave, and independent! The idea of a princess with autism or ADHD is wonderful, too. The only ADDish character I could think of would be Lilo or possibly Alice (only because of her extremely short attention span), and a princess with some sort of disability would be a great thing for many children who are diagnosed. I also think there should be a Hispanic princess somewhere along the way…and has anyone else noticed that there are six white girls yet only one of each other race, not to mention how they went immediately back to white princesses after a black one was finally made? As for the redesigns, I don’t think that Poca, Mulan and Jasmine are that white-ified. I think the skin-tones are actually closer to what they’d be in real life. My problems are with the obvious things; Belle’s crazy volume-amped hair, the huge fire-nation hairstyle Mulan wouldn’t ever care to try, and Pocahontas’ ten pounds of jewelry. Also, one thing I have to say: Cinderella. Her dress is a light silvery-blue, if not white, and her hair is WAY sooner red than it is blonde. Plus, what’s the point of all the crazy sparkles and hairdos? We know that’s nt what they all REALLY look like…why’s it like that here? I would much prefer to see a lineup of the princesses as they originally were, thank you very much. Little girls wouldn’t mind. They just…they need to be the Disney Princesses, not a bunch of girls in the popular-clique dressed up for homecoming. Each outfit should reflect something about themselves; the hopeless romance of Cinderella’s sparkling gown, Belle’s bookish quaintness reflected in the small amount of jewelry she wears, Pocahontas’ adventurousness and daring shown in the way of her simple dress, bare feet, and long, freely flowing hair. If a Disney character were to have a mental disorder like autism, they’d only be comic relief, like Sheldon in Big Bang theory. These disorders may be more prevalent in children today, but there is no serious way to make them marketable without either being patronizing or making fun of it. And sad to say, Disney is only interested in making money. I’m really peeved by this. That’s not true at all-some of the characters outfits don’t match their personality, and , yeah they have changed a lot of the characters, but it’s nothing too dramatic!!!! I think most of you are making a big deal out of nothing! WHAT company has never changed, never grown?? Without change, new “fads” or generation prefferences would sweep them out from under the rug. Alot of people are saying COMPLETLY irrelevant things! Gosh!! Next your going to say Anna looks like Rapunzel! mexican TV (and beauty pagents) always use white / classicly spanish origin actors.Mestiso or indian hardly ever appear,the exception being India Maria ,a slapstick comedy figure.I’ve asked mexican women about this,and they dont seem to notice.For them its normal to portray everyone as white !Somehow the majority of the population has been conditioned to see “white” as the standard to judge by.I tell them that Jesus Christ was aramaic,-shart dark-skinned,black hair and today portrayed as tall,white,blue-eyed,light-haired —–,but they cant seem to see the parallel ! There needs to be a change of perception made here at a very early age……. I agree with everything you have pointed out here. I agree that there needs to be more diversity. But let me point out something. “The Snow Queen” is a northern European fairy tale by Danish author Hans Christian Anderson. It is completely appropriate that the characters be Caucasian with light-coloured hair. However, if we are going to insist on being true to the characters’ ethnicities, then this next “princess” should be white and blond because that is in keeping with her ethnicity. You have a good point. A lot of those stories are based on the culture they come from, and the original Disney stories were based on European fairy tales. I just wish they would look into other cultures a little more to find other myths, tales, or cultural stories to broaden the spectrum of cultures they portray overall. The preferred complexion in much of Asian Art (including dolls, noticeably in Japan, China and Korea)is powder white, so if we are to be ‘true’ to the ethnic origin stories, Mulan when wearing formal gowns should look Very white. Now when she is in her warrior or feed-th-dog wear, sure, some color is appropriate. Even then though, she would have been protecting her complexion from the sun. I really don’t see what the issue is with their character revamp. So Pocahontas acquired some more definition to the nose (still not a caucasian nose). Mulan learned how to apply make-up. That does not make them “white”. If anything, their new skin tones are more true to what it would look like in reality. Disney should try to introduce more non-caucasian princesses/heroines to their line-up though. Like Rachel said above, they should focus on broadening their spectrum in terms of diversity. Introducing a female character with a disability would be wonderful; it really goes to show little girls that not everybody is perfect and that disabilities are not something to be ashamed of. People are getting too easily offended these days. I agree 100%. As a young girl, I LOVED Disney movies, but it had very little to do with the beauty of the “princess” characters in them. All of them were portrayed as individuals who wanted to break the mold, and that’s ALL I saw and admired. My parents raised me to value myself for my mind, not for my looks. I think PARENTS need to take more responsibility for any negativity that they think Disney is displaying to their daughters. I can’t tell you how many mothers (and fathers for that matter) I have seen who think it’s SO cute that their daughters want to be pretty princesses. Shame on these parents for blaming Disney for their own failure to have a meaningful dialog with their daughters. I agree. more emphasis on who they are and less emphasis on the associated play being solely ‘gems, teaparties, handsome princes (though I am guessing those don’t sell well)sparkly dresses’ and tiaras. Princess Diana (whatever her flaws) certainly was a clothes horse but it wasn’t all tiaras and ball gowns for her. The backstories to the Disney Princesses have more to them than just Dancing till dark as well. Honor and hard work and kindness were prominent for many of them. If you really don’t see an issue with this then you’ve never taken a race relations class or read anything on the point. Companies like Disney always try to whitewash everything. That’s a fact. It’s not about being offended, it’s about representing all other people in the world and not making them look more European, which is what they are doing. The world is Eurocentric (look it up) and it’s a very big issue. Even in Mexican soap operas they prefer light skinned actors, there are a million articles about this–they don’t cast indigenous looking Mexicans (as in darker skinned, wide-nosed, not blue-eyed). Society has created the ideal beauty as being more white–the norm–and continually pushes other non-Europeans to the side. What people tend to forget is that we are one race( race being a human made-up term) and simply have an array of outward appearances. But inside we’re the same. My daughters grew up with the Disney Princess’, one prefered Tink because of her attitude, the other either Belle or Ariel and one Cinderella. I never thought anything about race but who each one was and why they liked her. Not because of her hair color or skin color but who each one was. Disney i think has included alot of nationalites in their Princess’ and i feel like it includes a vast array of nationalities. Look at America Girl, they have very few dolls that are of different Nationalities. I just find it difficult to always play the color card, maybe because i find more in a person than the color of their skin. This is an important discussion, and thank you so much to Shavon L. McKinstry for writing this piece. I keep reading everywhere that we white folks are losing the grip of majority in the U.S., so why on earth is Disney acting so ignorant about it? You think Disney is in denial, or that maybe its diversity stance is fake? I think so. I also think that John Wiede (in his comment above) is right, that a lot of not-white folks are just as conditioned as whites are, and won’t notice some of the points of exclusion he brings to our attention. Also, a lot of white folks are going to take their daughters to see Pocahontas and Tiana, and think they’re “cute” because they’re the minority among Disney’s princess population, and not “trying to take over”. i gave up on disney dames a long time ago. they all look alike and teach bad lessons to impressonable little girls. if the older films featured any characters of color, they were horridly stereotypical, like the singing crows in “Dumbo” or the storyteller in “Song of the South”. so glad i have no children. it is a joy to refuse to feed the companies that tell lies. I have 2 daughters born in China. When they were little, we wore out Mulan on VHS and DVD in both English and Mandarin versions … When we visited WDW one February we celebrated Lunar New Year with a Princess Breakfast in Epcot – all of the other little girls came decked in princess clothes. My daughters proudly wore deep green and gold qi pao … And I was grateful all of the Princesses made a BIG deal out if my girls and Mulan posed at length with them. I have been disappointed that Disney did not do more with Mulan, and Pocahontas …. In fact, as we are annual visitors I have to say it is very noticeable that you do not see much of Mulan in the parks and only find Pocahontas in Animal Kingdom at a specific show …. Well maybe since Merida has a bow and arrow demo/activity in her Meet and Greet, perhaps Mu Lan could have something from her warrior activities as well. Or even very simple brush writing of symbols or names in Chinese characters? There are so many more possibilities than are used. I would like to see a gay princess, personally. Maybe someday? Princesses sell. Toy manufacturers look at their marketplace and put together a business plan. Its not, JMHO some Evil Empire plan to only make and sell White Glitzy Dolls. Or white, glitzy movies. More people of diverse backgrounds in on the ground floor of storywriting, marketing, animation, design etc etc would make more difference than can be done After the fact. We have Merida/Brave because Brenda Chapman had a vision she wanted to bring to life, of a young girl who was NOT in to being married off as chattel, and Ms Chapman was in a position to know folks who could help her in the door. The Pocahontas movie and Disney in general are problematic. They twist the facts of the real story of Pocahontas for the sake of a nicer version of these events. Pocahontas isn’t a princess at all either, since they do not exist in any Native American culture. They are perpetuating a stereotype that was made up by white men to give to Native women, so that these men could ensure that these women were worthy of their affection. It has racist remarks during the course of the film as well. Disney continues to profit off of sexist and racist movie (Peter Pan) and I have complete lost faith in them. I hope that one day they can create characters which would be ideal role models for children. I gave up on fairy tales completely by the time I was seven, Disney-fied or otherwise. The last time my mother read us a fairy tale, my younger sister triumphantly pointed out that in almost every single fairy tale with more than one princess in it, every single ‘older’ princess ends up being the evil one, and punished horribly, while the ‘younger’ princess is more beautiful and gets the prince. That’s all that mattered; who was born first. Oh, and the evil sister always has dark hair, like mine, while the good sister has blonde hair, like hers. So I proved her right, and punched her in the nose. That was the end of bedtime fairy stories. Ya’ll can whine an cry all you want but the bare fact of the matter is this: Disney is in this to make money, not promote racial diversity or girls’ self image. The skinny white girl merchandise sells better than the non white white girl merchendise. This is why there will never be a fat princess, a princess with facial deformiaties, they wouldn’t sell. More to the point, it’s Disney! The promote crap like Miley Cyrus and Phineas and Ferb. They stopped being a company that could produce anything of quality decades ago. And finally, it’s a kids movie; as long as it’s entertaining, they don’t really care what color the characters were. When I was a kid, my favorite was Jasmine, because she was willing to stand up to Jafar and say right to his face she’ll get rid of him when she’s queen, and I am not Arabic in any way. Disney is just following the money people, diversity takes a back seat. My kids are mixed. My daughters love Disney princesses and not once have they mentioned skin color,even though they both are dark skin. My oldest likes Ariel and my youngest likes Rapunzal. They have seen Milan,Pocahantas,princess and the frog and Aladdin. But the dark skinned princesses are not their favorites,they don’t care much for them. The only people who care are adults. Kids are too innocent to see color. They see fantasy story lines and talking animals and that makes them happy.